Last month we were working in Bani, a branch in Alaminos District. 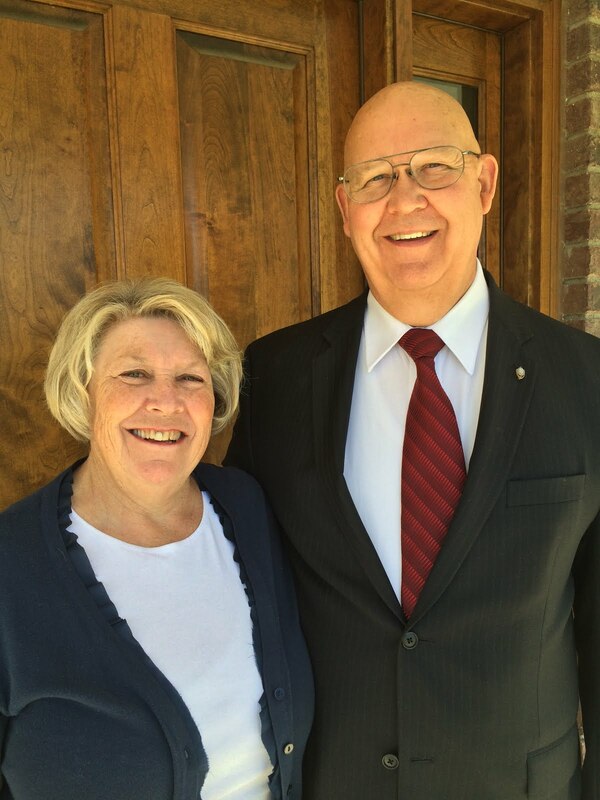 The Elders Quorum President took us to his home to meet his wife. She told us that she had to quit teaching Primary and Sunday School because she cannot see the books and manuals to read them. She has Cataracts and told us that she was too old to have them removed. She is only 72 and we explained to her how simple the surgery is and the wonderful results. She was nervous but after explaining it to her, (I had cataracts removed more than 15 years ago) she seemed to relax and gain some confidence. We told them about Mabuhay Deseret Foundation and Charity Vision. She can have the surgery without any cost. When I called the director in Manila to learn what they needed to do she invited us to meet her and the founder who was going to be in a town near us. These pictures are taken at their eye clinic that they are preparing to open in San Fabian, Pangasinan. During the years 1986-1989, Dr. William Jackson and his wife Audrey, presided over a mission for the Church of Jesus Christ of Latter-Day Saints in the Philippines. It did not take long for them to learn to love the beautiful Filipino people, but they were surprised at the number of children suffering from terrible disfiguring disabilities. Hare lips and cleft palates were common and many children were suffering from crossed eyes and club feet. Many miracles occurred, Doctors and Hospitals volunteered and donated their services and one by one children were blessed. With the help of other church leaders and the local community, the Mabuhay Deseret Foundation was formed. Children were brought in from all over the country to a hospice house in Manila and the first surgical program was organized at St. Luke’s Hospital. Since then the foundation has expanded to include hundreds of volunteers operating out of 12 medical facilities located in the regions of Luzon, Visayas and Mindinao. Upon returning to the United States, Dr. Jackson met others who had similar experiences in third world countries. The feeling was unanimous that the program in the Philippines could be duplicated in other countries. American doctors indicated a willingness to donate their time to train local doctors in the skills that they would need for the specialized care of indigent patients around the world. Since the philosophy of the foundation is to utilize all donations for the “direct care” of those in need, these volunteer physicians have since traveled the world at their own expense to help make this dream a reality. Since these humble beginnings in 1988, millions of dollars worth of medical supplies and equipment has been donated to Mabuhay Deseret Foundation by major pharmaceutical companies and charitable institutions around the world. For every dollar that we have received nearly $100 worth of professional services and medical supplies has been delivered to those in need right here in the Philippines and around the world. Today, Mabuhay Deseret Foundation has expanded into more than 20 countries and has adopted the name Deseret International Foundation / Charity Vision. Through the efforts of thousands of volunteers, doctors and our generous supporters, we are now providing over 15,000 life-changing surgeries every year, to indigent people around the globe.